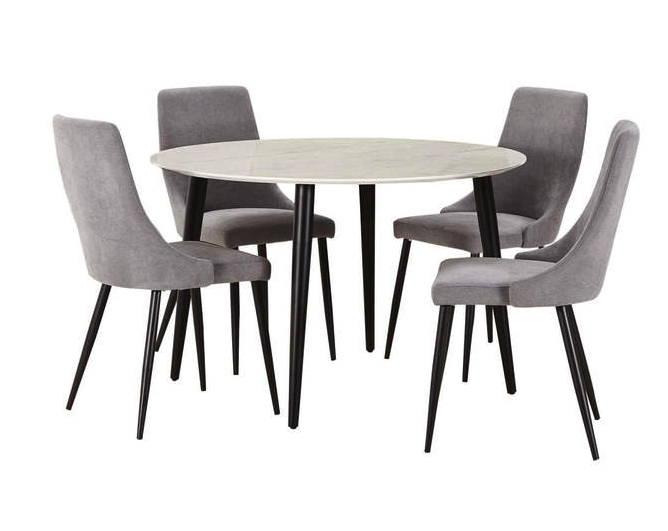 Get the look of marble for less with this sophisticated dining set. Featuring a marble effect surface with a high gloss finish, now you can enjoy glamorous dining in the comfort of your own home. 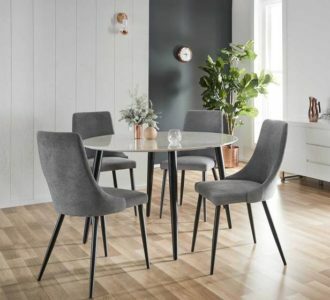 Tapered powder coated metal legs complement the sleek design of this stylish table whilst providing sturdiness and strength. The Lyon chair features fine tapered metal legs, upholstered padded seat and a contoured back for style and comfort. With a nod to mid century design, this classically styled dining chair will add a touch of elegance to your dining room. Fine, tapered metal legs add a contemporary flourish and provide sturdy support.